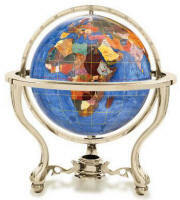 Gemstone world globes are handmade with a variety of semi precious stones that are individually hand carved into the shape of countries and continents and have several options of beautiful floor and desktop gold or silver plated stands. Each lustrous gemstone globe is beautifully inlaid with over 25 semi precious stones selected from countries around the world and, where possible, show the country of origin. Longitude, latitude and international date lines are added with a fine gold or silver thread. Any room in your house or office will benefit from displaying these luxurious gemstone globes. Copper 3" Black Opalite 3" Opal 3"